Blue Angels Pilot Dies After Crash During Training Near Nashville : The Two-Way The jet went down in an open field not far from an apartment complex, local officials said during a news conference Thursday afternoon. A Navy pilot who flew with the Blue Angels — some of the group's planes are seen here last September — was killed in a crash southwest of Nashville on Thursday afternoon. 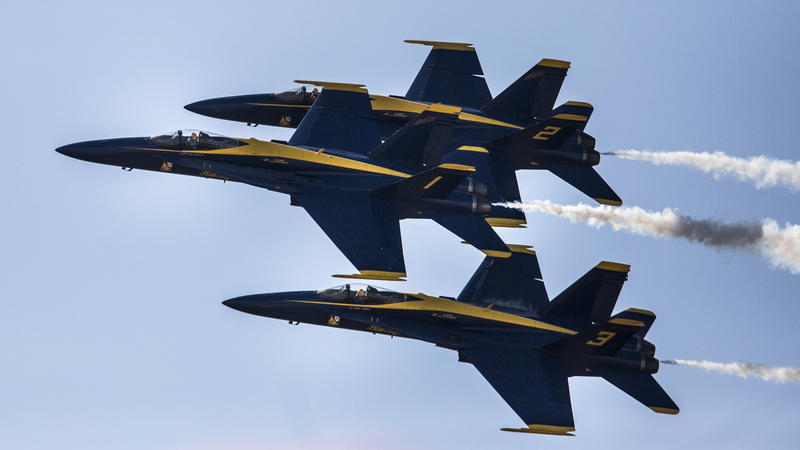 A U.S. pilot who was part of the Navy's Blue Angels demonstration team died Thursday after his F/A-18 aircraft crashed in Smyrna, Tenn., southeast of Nashville, according to military and local officials. The Blue Angels had been preparing to hold an air show this weekend. The jet went down in an open field not far from an apartment complex, local officials said during a news conference Thursday afternoon. The crash occurred some 2 miles from the runway. "The pilot of the jet was taking off to start the afternoon practice when the mishap occurred. "The name of the pilot is being withheld pending next-of-kin notification requirements. "The other five Blue Angel jets were not involved in the incident and landed safely moments later." The crash occurred at approximately 4:01 ET, just as the team's afternoon practice was beginning, the Navy says. "The military flying team was in the middle of a nationwide tour to celebrate its 70th anniversary and was scheduled to fly at the Great Tennessee Airshow this weekend. Earlier in the day, a team of six jets flew over downtown Nashville, releasing streams of white smoke in a highly publicized fly-by." An amateur video that seems to show the jets flying before and after the crash — but not the impact itself — was posted to Twitter. Local newspaper The Tennessean spoke to witnesses who say the crash was like something out of a movie. One woman who lives about a mile from Smyrna's airport said it sounded like a car had crashed into her house. A man who was watching the Navy planes when one of them crashed said that the maneuver the plane was performing seemed to be one in which the pilot flew up, then down and across an open area. But after the plane was pointed at the ground, it seemed like "he had no thrust," the man told local TV news WKRN. The Blue Angels crash occurred just hours after another plane in America's elite flying teams went down, as an Air Force Thunderbird crashed near Colorado Springs after performing in an air show commemorating graduation day at the Air Force Academy — a ceremony at which President Obama delivered the commencement address. In that incident, Maj. Alex Turner was able to fly his aircraft to an unpopulated area before ejecting. He was unhurt and even managed to make it back to the airport in time for an impromptu handshake and chat with President Obama on the tarmac, before the president boarded Air Force One.